Alternatively, it is also possible to integrate a third-party system with ITM Platform’s time report through the API (Integration Interface). This is useful when an organization already uses another system, but wants to analyze effort and cost information from within ITM Platform. It contains all tasks and activities assigned to a user during a given period, and allows reporting of hours per day, adding comments for each time entry and, if you are responsible for the task or activity, you can also add a progress report. This module offers a series of visual information aids that allow the user to have better control over it and be more productive. In a predetermined way, the timesheet offers a weekly view, although a different range of between 1 and 30 days can be chosen. Contains actions that facilitate the visualization of tasks and periods. When you click on one of the available boxes to enter data, you can perform two different actions: enter hours and enter comments. A red corner indicates that hours have been entered, but not yet recorded, and a comment symbol will indicate a comment on that day for that work item. A button will give you the option to write or edit an existing comment. These comments will not be visible by the rest of the team, only by the person who introduced it, and the project manager. 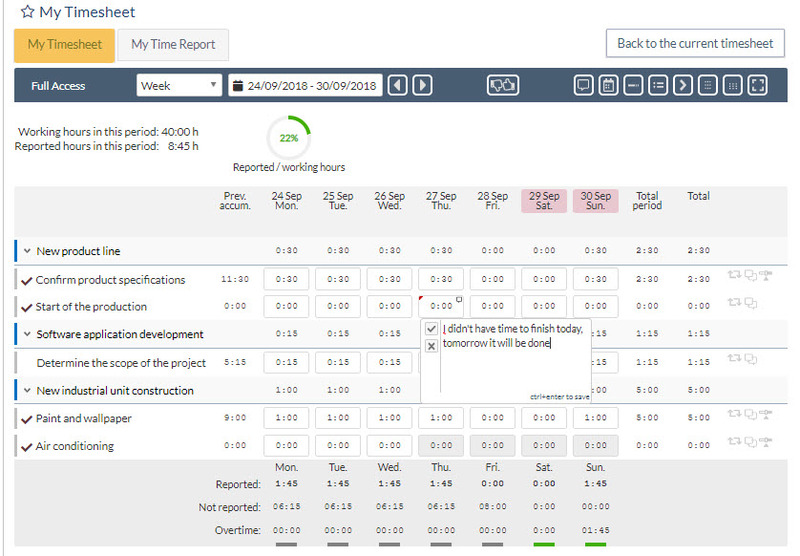 On the right hand side of the timesheet, a number of options are offered which affect the entire task. If you are responsible for the work item, you can add progress report. At the bottom you will find a summary per day of the hours reported, compared with the working hours of each day. A color coding shows a difference of +-20% over the daily working hours, gray indicates that they have not been reached, and red that they have been exceeded. If you choose on the control bar to show all comments made in the period, they will be displayed at the bottom of the screen, grouped by date or by work item, as you have opted with the pivot button. Project managers and portfolio managers will be able to access all comments from the “time” report type. 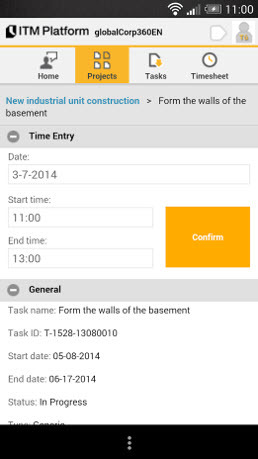 Reporting hours from the task list, allows you to not only enter hours, but also the start and end time. It also allows you to report the same hours to a range of dates, in case you do the same routine all those days. You can download the mobile app from Apple Store or Google Play and report hours from it. As a feature, this application has the functionality to “Start/stop” a task by clicking a button, and submit when finished, useful in ta work field work or when start and end times are required.